The British Gazette » Base jumping: Brexit. 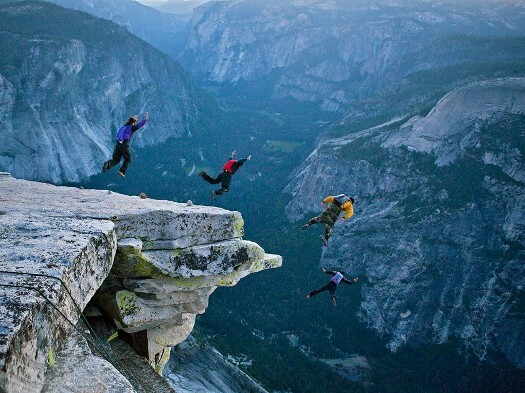 Above, base jumpers at Yosemite, California. We start today’s article on a theological note. When the Almighty created the Heavens and the Earth, did He have in mind a reason for creating precipitous high peaks such as El Capitan? That he did not give Adam or Eve wings is of course a known fact which most of us – with the possible exceptions of Mr Luke Atkins and the Hon. Jacob Ress-Mogg – accept! And yet there are people – such as those in the image – who like nothing more than to emulate the birds and to throw themselves of high cliffs! Presumably to the very great bemusement of any passing eagle! Pity then the Unfortunate M. Barnier who has been tasked with negotiating for the EU “Brexit”. It appears that Dimwit Davis and his colleagues – whoever they may be after divers investigations as to “who touched who’s knee” – or lower back – where and in which decade; 1970’s, 1980’s or later – are most reluctant to engage in substantive discussions. Of Dimwit’s carryings on, I am, Dear Reader reminded of my own antics – as a small boy aged around five – when my mother took me to the doctor for an injection! It might – my memory is not 100% on the matter – have been for a polio jab – these being the days before other methods were found for this inoculation. Although my memory of what precisely was the purpose of the fluid contained in Dr. Danks’s hypodermic needle is vague, my intention to avoid the needle pricking my skin is clear! Dr. Danks did however succeed in his task for which a much delayed vote of thanks from Moi is sent. It should also be recorded that the local Practice Nurse at the local Health Centre did not experience the same difficulty that Danks had had with my recent “flu jab”! As always, the excellent and learned Dr. North has in his blog-post today (http://eureferendum.com/blogview.aspx?blogno=86658) is performing a valuable – if unheralded – service to the British People by keeping those who take the time and trouble read his efforts realise. Of Dimwit and his colleagues, one is forced time and time again to the conclusion that they may be planning to present the British People with a choice or their own devising – not the Unfortunate M Barnier! That is to contrive a situation where the long suffering and greatly deceived British People are presented with a choice which is the equivalent of throwing themselves off Beachy Head (sans parachutes!) or walking back to the open prison in which they have been incarcerated! In other words: A Second Referendum! Most members of the House of Commons want the UK to remain in the EU. They would much prefer it if the British People reversed their decision of Thursday 23rd June 2016!